It’s never too late to get into gardening – for health, for exercise, for beauty, and for peace of mind. There are lots of tips and tricks for doing it well, and gaining the most benefits you can. And: if you’re done with your first round of setup and planting for summer, by all means keep at it. At The Guyer Institute and Synergy Spa – a med spa that meets all your needs – our founder knows from experience that there’s no garden that can’t grow more produce, plants, and other nuggets. They are beneficial for your body and your stress levels – improving both can leave you feeling better and looking better. Dr. Guyer feels calmer when he gets to work in the soil, sometimes planting and harvesting, sometimes just watering or making sure his garden looks attractive, too. There are a multitude of references on line about gardening – some will help you if you’re new, others are great for learning more and growing better. Next, some primary matters to consider, and decisions to make. What do I want to grow – and how much of it? How will it be organized? It is often more advisable to start small rather than start big. You can add on at your own pace. What will the location be, and how big? Seek to maximize space in the garden by avoiding traditional row planting and instead, try 3 or 4-foot wide raised beds. Read up on the vegetables and fruits that interest you. Take a visit to your nearest greenhouse or gardening center. Look around, ask questions. Choose and purchase your seedlings to get a faster start. Many “starts” or seedlings are available from your local nursery—for example: tomatoes, peppers, onions, broccoli, and melon plants. 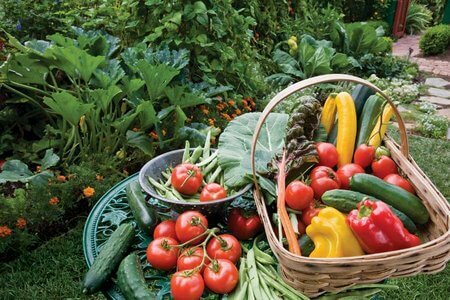 Get your basic gardening “gear.” Gloves, a trowel for working with the dirt and planting, a watering can and/or hose, the right kind of organic fertilizer, trellises for tomatoes, a wheel barrel and rake, shears, and a sunhat and sunscreen, too! Slugs: Collect by hand w/gloves, spray cold coffee. Consider a product called Monterrey Sluggo. Aphids: Spray off with cool water. Purchase ladybugs – they are excellent insect killers. Cutworms: Consider tubing the plants – sprinkle coffee grounds, or egg shells, and use oak leaves as mulch. Again, don’t try to do everything at once, and don’t expect perfection. Over a few seasons, you’ll have just the kind of garden that suits you and your family’s needs.